Suggest ways of improving the governance of the teaching human resources which are compatible with South Africa’s institutional and political realities. Basic education in South Africa has two distinctive features which make it an appropriate target for this project. First, a study of South Africa’s basic education system offers an ideal opportunity for multi-level research at national, provincial, district and school levels. The second distinctive analytical feature is the contested character of the country’s political settlement, which is likely to be particularly evident in the provincial and district level studies. How does the mixed reality of South Africa’s political settlement – part dominant party, part competitive, part developmental, part patronage – influence basic education policy-making and implementation at the national, provincial (including district) and school levels? Figure 1 illustrates ESID’s framework for analysing the links between a country’s political settlement and the quality of public service provision. Process tracing to uncover the relative strength of ‘trumping’ influence networks committed to results-oriented governance of the human resource, and of ‘predatory’ influence networks seeking to capture control of human resources for patronage or more narrowly personal purposes. A key analytic distinction in the study is between ‘long route’ accountability and multi-stakeholder governance. It may be necessary to accept constraints on ‘long route’ functioning as exogenous ‘givens’. Multi-stakeholder engagement could thus emerge as an alternative, potentially more productive, entry point for improving the governance of the teacher and principal human resource. How does this fit within ESID’s research agenda? Consistent with ESID’s objective of understanding how the characteristics of different types of country-level political settlements influence the operation and performance of public service provision in programme 3, this research explores how a political and institutional perspective can identify new options for enhancing the performance of key sectors. Levy, B., Cameron, R., Hoadley, U. and Naidoo, V. (eds. ), (2018). The Politics and Governance of Basic Education: A Tale of Two South African Provinces (Oxford University Press). Levy, B. and Shumane, L. (2017). ‘School governance in a fragmented political and bureacratic environment: Case studies from South Africa’s Eastern Cape province‘. ESID Working Paper 84. Kota, Z., Hendricks, M., Matambo, E. and Naidoo, V. (2017). ‘The governance of basic education in the Eastern Cape‘. ESID Working Paper 83. Levy, B., Cameron, R., Hoadley, H. and Naidoo, V. (2016). 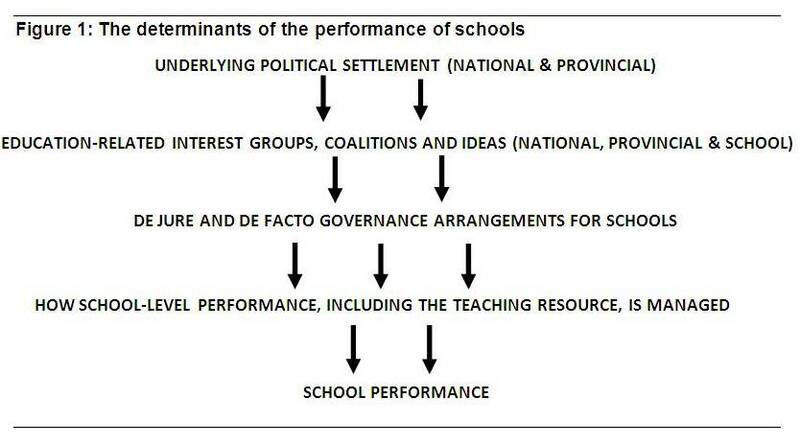 ‘The politics and governance of basic education: A tale of two South African provinces‘. ESID Working Paper 67. Cameron, R. and Levy, B. (2016). ‘The potential and limits of performance management: Improving basic education in the Western Cape‘. ESID Working Paper 62. Hoadley, H., Levy, B., Shumane, S. and Wilburn, S. (2016). ‘Leadership, stakeholders and learner performance in four Western Cape schools‘. ESID Working Paper 61. Cameron, R. and Naidoo, V. (2016). ‘When a “ruling alliance” and public sector governance meet: Managing for performance in South African basic education‘. ESID Working Paper 60.